Start off your visit on the 4th (Mon): tour the pleasant surroundings at Ocho Rios Bay Beach and then relax and rejuvenate at some of the top local wellness centers. For where to stay, other places to visit, reviews, and tourist information, go to the Ocho Rios journey tool . Miami, USA to Ocho Rios is an approximately 7-hour combination of tram, flight, and bus. You can also do a combination of train, flight, and bus. Expect a bit warmer temperatures when traveling from Miami in March; daily highs in Ocho Rios reach 36°C and lows reach 27°C. Wrap up your sightseeing on the 4th (Mon) early enough to drive to Saint Elizabeth Parish. On the 5th (Tue), admire the sheer force of YS Falls, then take a stroll through Bamboo Avenue, and then view the masterpieces at The Mud Palace Gallery. On your second day here, brush up on your knowledge of spirits at Appleton Estate and then tour the pleasant surroundings at Bluefields Beach. To see photos, where to stay, other places to visit, and more tourist information, go to the Saint Elizabeth Parish trip itinerary app . Traveling by car from Ocho Rios to Saint Elizabeth Parish takes 2.5 hours. Alternatively, you can do a combination of bus and taxi; or take a bus. March in Saint Elizabeth Parish sees daily highs of 36°C and lows of 26°C at night. Wrap up your sightseeing on the 7th (Thu) early enough to drive to Negril. 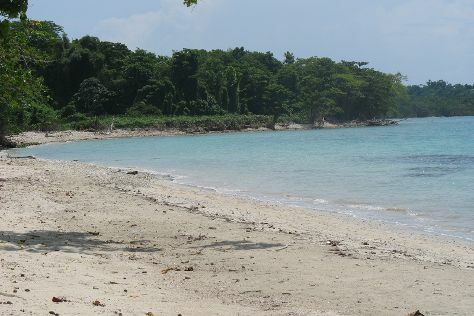 We've included these beaches for you: Seven Mile Beach and Bloody Bay. You'll discover tucked-away gems like Barney's Flower & Hummingbird Garden Jamaica and Distillery Tours. Step out of Negril to go to Pennycooke and see Original Mayfield Falls Jamaica, which is approximately 1h 05 min away. And it doesn't end there: pause for some serene contemplation at Mary, Gate of Heaven Catholic Church, look for gifts at Irie Art, take a memorable tour with Tours, and take in the dramatic natural features at Negril Cliffs. To find more things to do, photos, ratings, and more tourist information, refer to the Negril trip itinerary app . You can drive from Saint Elizabeth Parish to Negril in 2 hours. Another option is to take a bus. Expect a daytime high around 36°C in March, and nighttime lows around 26°C. 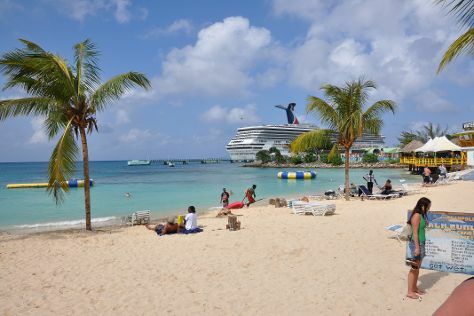 Finish your sightseeing early on the 10th (Sun) so you can drive to Montego Bay. Start off your visit on the 10th (Sun): surround yourself with nature on a nature and wildlife tour, then don't miss a visit to Hip Strip, and then stroll through Doctor's Cave Beach. Get ready for a full day of sightseeing on the next day: tee off at Half Moon Golf, Tennis & Beach Club, then kick back and relax at Burwood Beach, and then stop by Tropicana Jewelers. To find where to stay, ratings, and more tourist information, use the Montego Bay trip itinerary maker website . Getting from Negril to Montego Bay by car takes about 1.5 hours. Other options: take a bus. 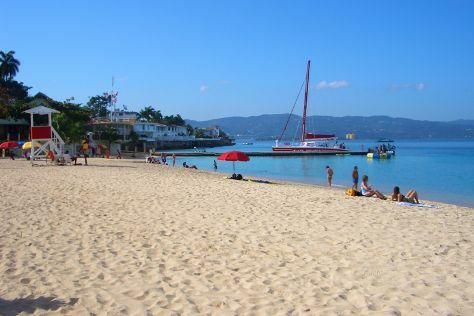 In March, daytime highs in Montego Bay are 36°C, while nighttime lows are 26°C. Wrap up your sightseeing by early afternoon on the 12th (Tue) to allow enough time to travel back home.